You can purchase the Advanced Stacker PLUS below or in the Store. Yosemite, Sierra or High Sierra with PS CC 2015, CS 2017 or CS 2018 have installation problems. We recommend you do NOT purchase this product unless you are using High Sierra and CS 2018 or CS 2019. There are no known problems with any combination of modern Windows (7 or later) and Photoshop versions. Please read here for detailed instructions. Take a look here for notes, Q&A and comments. Usage of the Advanced Stacker PLUS is very similar to prior versions. Below is a video that may help you get started. If you want to start at the usage example, please click here instead, or advance the pointer to 7 minutes and 6 seconds. NOTES: Version 14E Presents a dialog BEFORE it creates the base document. Press CONTINUE. See “Common Usage Problems Below”. The beginning of the video shows how to install ASP 14e on Windows. It keeps warning me about “color space” or image size, or popping open the Adobe Camera Raw utility. You also may get “Move is not currently available.” Be sure to check all the indicated options when executing. Also, be sure you only have ONE “StackResults.psd” document open. If you run the “Do This First” more than once, you will have multiple documents open and that makes a mess. The File->Automate->Batch DialogI(s) from different Photoshop versions have the same content but a different look. Click either for a larger view. After using intermediates, there is only one file that has been saved. See the issue above. There must be a “serial number” or all saved files will have the same name. I get an error “The Command ‘Move’ is not currently available.” The most common causes of this are described in item 1 above, however another cause is when layers are turned off or collapsed prior to running one of the stacking steps. Do not collapse layer sets. Also make sure you “Do This First” before attempting any other stacking. Finally, be sure you press Stop when the text indicates “PLEASE PRESS STOP now”, not on any other screen of the Do this First. Do NOT press Stop now. Nothing has happened yet! Do Stop Here! Note that the text will not be yellow. If Stacking seems to go a bit slow, hide the Layer Palette and Action Palettes and things will go quite a bit faster. Photoshop will not spend so much time drawing those displays. Indeed, sometimes the stacking goes so fast that you will not see the display update much at all until it is done. “Could not save a copy as …” This error occurs if you use the “with Intermediates but did not specify “Override Saves” and pick an output folder (see screen shot for 1, above). My images are watermarked and I do not want that! See Customizations, below. How do I select the output location for Intermediates? Select any starting serial number you wish. 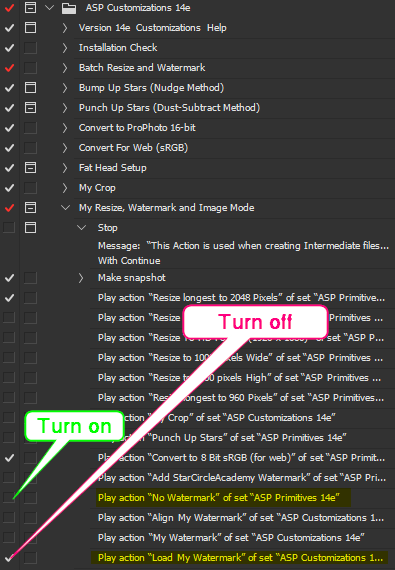 Be sure to select “Override Action Save As” and choose an output folder. How do I select the output format for intermediates? How do I select watermarking mode (or turn it off) for intermediates? How can I resize my intermediate files before saving them? RE,MJ: “Place Command Not available” when using Do This First. Unknown cause. Disabling the watermark resolves the problem (let us know if it does not!). How do I stop that ugly watermark? UGLY? Hey, we don’t think it’s ugly :-). But see Customizations, below. You may want to turn off the default watermark. There are two simple ways to accomplish that and a 3rd way you may find more appealing. The watermark is a layer in a layer group. 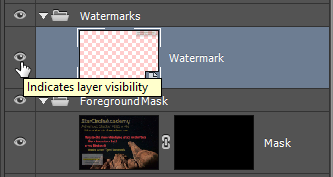 To vanquish it, turn off the visibility of the watermark layer (click the eye in the example below) on the Layer palette. To see the Photoshop layer palette use Window -> Layers or hot key F7. Then click the eye on the watermark layer. The actions expect a watermark group to remain, so do not turn off the eye on the Watermark Folder. 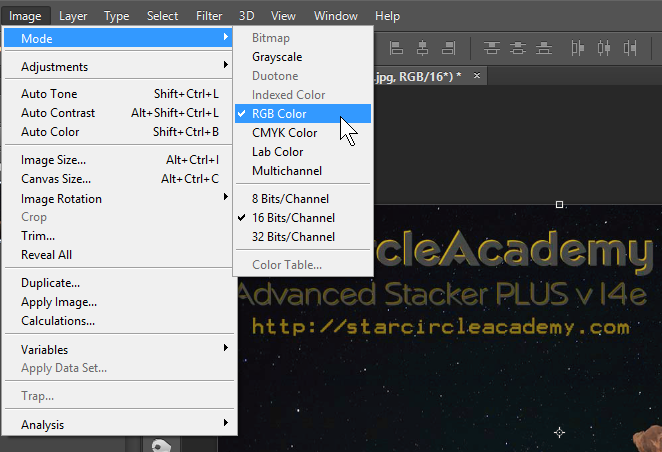 You can turn off this layer at any time – before or after stacking. Intermediate modes use a different watermarking mechanism (see 5, below). Disable watermarks by selecting a blank watermark (see Known Problem 1, above). Create your own watermark. 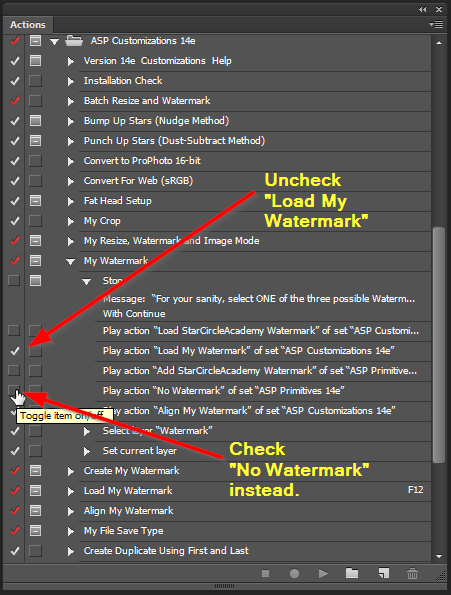 We suggest you use the “Create My Watermark” in the ASP Customizations, and then instead of turning on the StarCircleAcademy or No Watermark, select “Load My Watermark”. You can always turn it off later if you wish as described in step 1. Watermarks are automatically scaled to match your image size and positioned as selected in the “Align My Watermark” action of the ASP Customizations. If this dialog is turned on, you can turn it off. Franklin: “Convert Mode” not available processing Nikon D7100.NEF files in PS CS5 [believed to be due to CS5 not supporting .NEF files from this camera]. Please be specific about the nature of the problem. Doesn’t work or fails is like taking your car to the mechanic and saying “it’s broken”. To get help you need to say more. For example when does the failure occur? If the download links fail with an error message, tell us “Download failed” and provide the error message. If installation fails, please check the INSTALL instructions. If that doesn’t help, please specify what message or failure you get. If an error message pops up, what is it? If you get an unexpected result (appearance) – what was unexpected? Screen shots are often very helpful. (See here for how to get a screen shot on almost any machine). Before reporting a problem with using the Advanced Stacker PLUS, please check the “Known Problems” and Common Problems sections above. And please also do a fresh re-install. Consult the videos above, too. If needed we’ll contact you for follow up. By default the Test Stacker creates images that are 800 pixels wide and include a watermark. Of course the test stacker doesn’t have features that the Advanced Stacker PLUS has, for example, there is no Comet mode, no mode with intermediate files, and no Punch up the Stars operation. The Advanced Stacker PLUS does not have any file size or watermark restrictions. By the way, it’s interesting that you’re using DNG files. As far as we know, the Advanced Stacker PLUS (and Test Stacker) are the only tools on the planet that support that file type for this purpose. Thanks! I was looking around to see if I could find that info about the pixels, 9 more days then I’ll be able to buy the advanced stacker plus, I really like the test version, and I learn alot from your webpage so keep up the good work! Sorry, we were out of town conducting a workshop. But the answer to “how can you stop it from popping up” is to set the options as described in Item 1 of the Most Common Usage Problems above. It’s possible we shipped it incorrectly, or that you’ve accidentally turned on the interactive dialog option for that step. Make sure that the box to the right of the checkbox is NOT set. (Just click it to turn it off if it’s on). It’s also possible that you did not select Destination: Folder in the File -> Automate -> Batch dialog. I need to change some options in the actions, in particular the “convert to 8 bit sRGB (for web)”, but am unable to, as the only option I have found for editing is a non-working xtools that (when working) will convert atn to xml and back. A quick fix would be if you added a sRGB save action without save for web, as I need the exif data. Versions involved: Photoshop CC / StarCircleAcademyAdvancedPLUSv14d. I realise now that the EXIF is erased way before the save – it’s removed after the initial actions in “Do this FIRST” (StackResult), but I don’t understand how or why you deliberately delete the EXIF. Opening hundreds of Raws as layers and then merging/flattening them does not delete EXIF, so please clarify and help restore end-to-end EXIF. 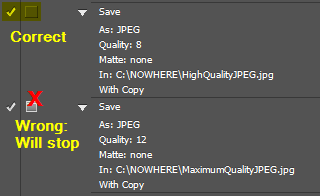 Unfortunately Photoshop only preserves EXIF data from the “base” document. In the example of a multi-layer stack, only the EXIF data from the first document loaded is kept which might not make sense if the EXIF data is different for each shot. NOTE: The Advanced Stacker PLUS 14E now preserves the EXIF data from the first loaded document (if any). Duplicate the flattened stack onto the original shot (Duplicate Layer to document) and then save. The EXIF data will match the original document that way (and you can rename the document however you wish when you save it). Also, while there is a conversion to 8 bit RGB there is no “Save for Web” option in Advanced Stacker PLUS. You can add a new save type if you wish by recording a new Save Step in the “My File Save Type” action of the Customization set. We will look into trying to preserve the EXIF data for the first-loaded document, but we’re not sure that will make sense in all cases. Many commands do not work if not in the expected color mode. By the way, anytime you get ANY error you should stop. Once one step fails there is no way to insure the integrity of the operations. If, for example, you get any error at Do This First it’s pretty much a guarantee that stacking steps will fail because layers or groups may be missing. 2. The “Customization” set appears to have been damaged. Reinstalling the original distributed action sets did solve the problem. Hi guys!! I just downloaded the stacker and am getting all of the errors noted above and then some. I tried reinstalling the actions which at least corrected the issue I was having when running ‘do this first.’ However, I am unable to get anything to run because of the error “The object “document “StackResults.psd”” is not currently available, followed by all of those noted above if I click on continue. I did not follow all the way through. any help would be greatly appreciated! Which computer, OS and PS versions are you using, Ali? Andrea wrote: Just starting to try night photograph and star trails. Saw article by Matt Molloy and his suggestion of Star Circle Academy program for what he is doing with clouds. This lead me to your sight. I am a beginner and do this for fun and with my local camera club, so I do not have full photoshop. Just hoping I can do something similar with the programs that I have. Sorry, Andrea, but Photoshop Elements doesn’t offer all of the features needed. And Lightroom is also a poor vehicle for this purpose since Lightroom does not natively support layering of multiple photos. 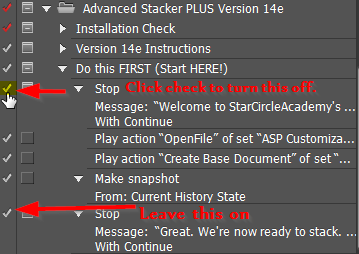 If you look around you’ll find standalone programs like StarStax that will do some of what Advanced Stacker PLUS does and you can then re-import the results back into Photoshop Elements or Lightroom to complete your editing. I’m installing the new upgrade ASP14e_Mac for the Macintosh OS X version 10.9.4. with Photoshop CS 6. After the installation in Photoshop the PSD watermark loads with a dialog error “command place not currently available”. Hit OK and new error dialog “not able to complete installation check please close photoshop manually. Hit OK and new error dialog appears “Error: general error occurred. This functionality may not be available for this version of photoshop. Could not complete command because there are no layers to be moved. I’m unable to determine is the installation was successful or not. Please see “Known Problems” Item 1, above. Once you get ANY error from Photoshop you should stop and start over because a layer or operation has failed. 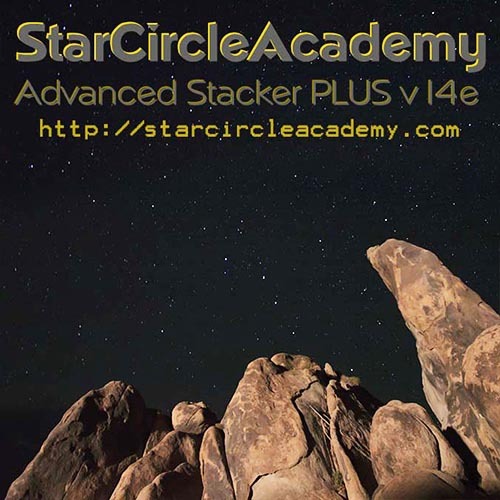 If i buy the “Advanced Stacker PLUS Version 14” in the future do i’ll have access to free updates ? David, We can’t make any promises about the future. We’ve discontinued Stacker Light – it ceased making financial sense to offer it. We clearly stated that we do not offer email support for Stacker Light but many people were undeterred. Most of them were asking for installation instructions despite the written instructions and video which were sent along with the purchase details. We are actively supporting the full version, but even here we have limits on what we’re able to help people with. 2. How significant the updates are (we’ll offer bug fixes for free, but significant feature improvements will incur a fee). 3. How well we can manage updates in our ordering and tracking system. You mention that there’s a must-update-by date. Is this mandatory? I just got the previous software installed about two months ago and we had some issues getting it set up and running. It’s not a priority for me to update at this time, as I’m quite busy — and I want to make sure the software won’t stop working because I didn’t update. No updates are mandatory, however in the next update we will be squashing a few bugs and usability issues. The point of the “update by date” is that beyond that, there will be a charge for the update – it won’t be free. Sorry that you had an issue with getting everything working… that’s one of the bugs we are addressing! How do you cope with 18% grey skies? Here in the northern part of the UK clear skies or interesting cloud skies are merely wishful thinking at the moment. I’m sorry I can’t offer a better solution! I am interested in Advanced Stacker PLUS. How to download the test stacker? Would you kindly let me know? We discontinued the Test Stacker, Sorry. I purchased the Advanced Stacker Plus with 2 hr instructional video, but can’t seem to find how to access that video. Please advise. The link to the video comes in the same email with the link(s) to the Mac and PC versions of the software. It’s NOT the email you get from PayPal, by the way. The PayPal email is a purchase confirmation that is NOT sent by us. Good question. Since this is a Photoshop add on, you don’t need anything beyond what Photoshop requires. When I start the installer it wants to install it in CS5, is there any way around this? Haven’t tried uninstalling CS5 yet. The installer will insert itself into every version of Photoshop that it finds – one at a time. It found CS5 first… let it keep going and it will install in the other versions it finds. hello, i wanna buy this for stacking clouds like a time stack. However, i am not sure if my mac is supportive when it see Mac 10.11 not supported, I am confused. my version is OS EL Captian 10.11.3. Please let me know. Thank you!!! At this point, Tianyang, Mac Yosemite and El Capitan are not supported. We finally got our mac fixed and updated to El Capitan, so we hope to track down and fix the problem(s) soon. Hi. Do you have any updates on when the El Capitan issues might be fixed? Thanks. Thanks for asking… we now have a working Mac again… but haven’t had a chance to look into the issue as yet. How about now? It’s been a full YEAR since your last response. It would sure be nice to buy and make use of your product, but I’m not changing to Windows just for that. Sorry, but attempting to brow-beat us won’t help. Keeping up with Mac OS changes is a time consuming and unpleasant task. By comparison, we’ve had to make NO changes for the Windows version and it’s been working from Windows VISTA all the way through the current Windows 10 anniversary edition – and with all versions of Photoshop that have come along in between. If there are any Mac literate developers who would be willing to work with us we will be glad to entertain a cooperative model. Meanwhile we will keep poking at the problem as we have time. Had to upgrade now running El Capitan and Photoshop CC 2015 repurchased a copy APE and I cant get the same list in Automate batch, no do this first or lighten options its all about watermarks? Sorry, don’t understand your question. What is APE? What does “cant get the same list in Automate batch” mean? We state on our purchase pages that we do not support Yosemite or El Capitan. Now Sierra is on it’s way out and that doesn’t work with Adobe products as of a few weeks ago. So Apple’s cooking isn’t just killing us small-fry developers, it’s also unfriendly to large companies with extensive staff. Funny, but despite all of Microsoft’s bad choices, our tool seems to still work without us having to change anything. can I use Advanced Stacker PLUS Version 14E (PC Win 10) version CC 2017 on the different language PS version cc2016 ? Different language meaning non-English? We believe so as we have Germans, Brazillians and many others using Advanced Stacker Plus in their native language versions of Photoshop (though ASP is NOT available in any language other than English). 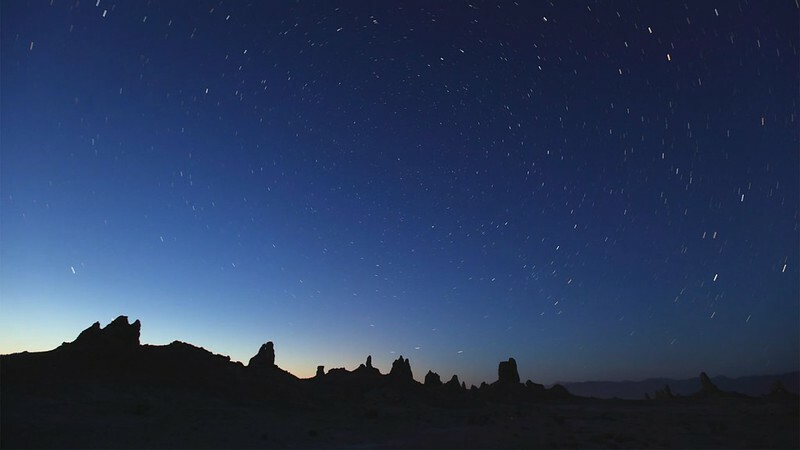 In particular, put your finger on one of the star trails and notice that later that trail is no longer there. This transition also allows for the image to grow brighter or dimmer gradually. Some additional tips and notes on timelapse are in part 2 and 1. PS we always recommend that you take two or three times as many images as you think you will use… the extra shots may allow salvaging of an otherwise unsalvageable shoot. 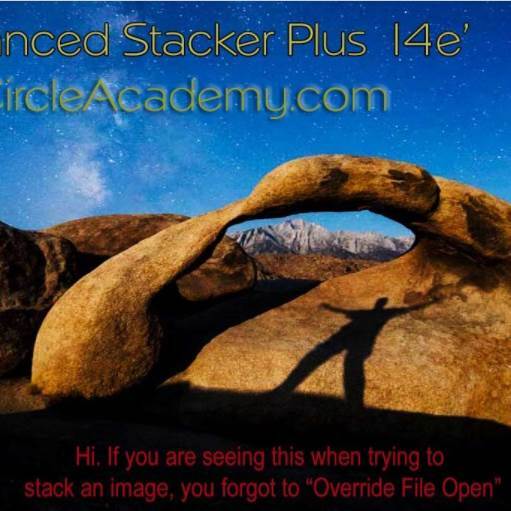 Folks- I have Advanced Stacker Plus Version 14E, and do not see the command to ‘Load and Stack in Lighten Mode’ – i see only ‘LIGHTEN mode – Recommended’. Any ideas on how to proceed? Working in PS6, Windows 7 on PC. Thank you! LIGHTEN Mode – Recommended is the name of the normal stacking operation. There is also LIGHTEN with Intermediates. Before you do either you must first do “Do this FIRST (Start HERE! )” If you scroll down from the top of this page you’ll find a 10 min 29 second video that shows how to install and use the product.